Chilli pan mee...without the chilli, yet! 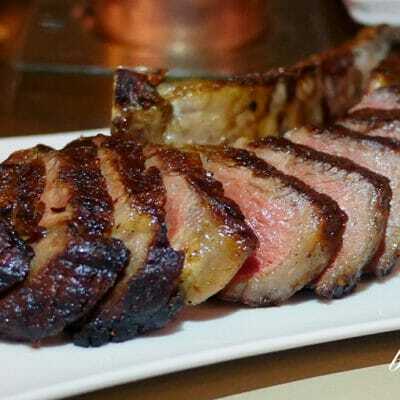 Would you tolerate bad service if the food is good? 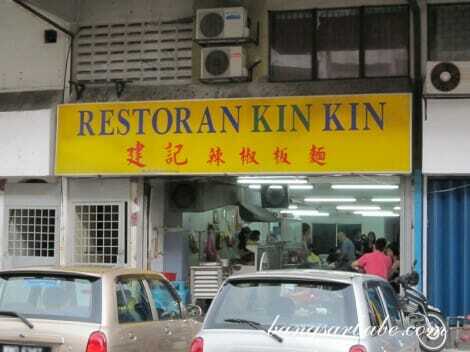 I remember my first time at Kin Kin Pan Mee and it wasn’t a pleasant one. That was almost five years ago and I refused to eat there again until a few weeks ago. Mum in-law wanted to eat there, so I relented. Never rush the auntie...unless you want some scolding. This time around, my experience was better. An old uncle attended to me and he did so pleasantly. The wait was long but since our table was under a fan, I didn’t mind much. You can choose to have your pan mee with soup or dry; I prefer the latter. 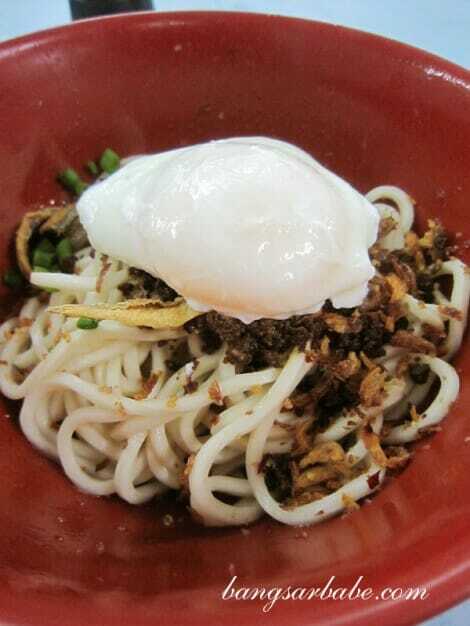 A dry pan mee (RM5.80) comes with minced pork, crispy ikan bilis and topped with a poached egg. 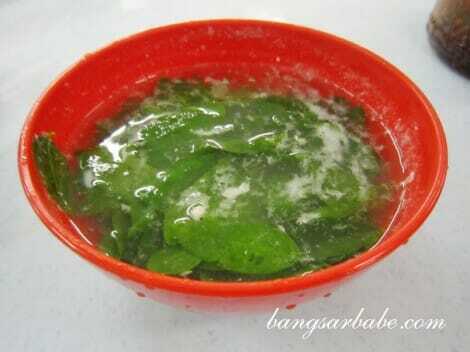 You get a bowl of soup with sayur manis as well. Bring on the chilli flakes! It isn’t called chilli pan mee for nothing. 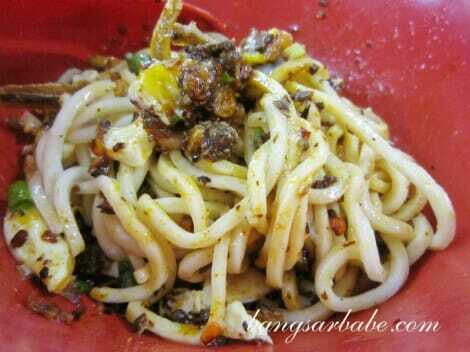 You need to eat the noodles with the famous dry fried chilli flakes, but go easy on the amount. Two spoons is just about the amount I can handle, without feeling as though I’m about to die inside. The yolk oozed out at the poke of my chopstick; runny, smooth and coated the noodles nicely. We found the chilli flakes at Kin Kin tastier and more aromatic compared to its competitor across the road and the noodles had a firm yet springy texture. 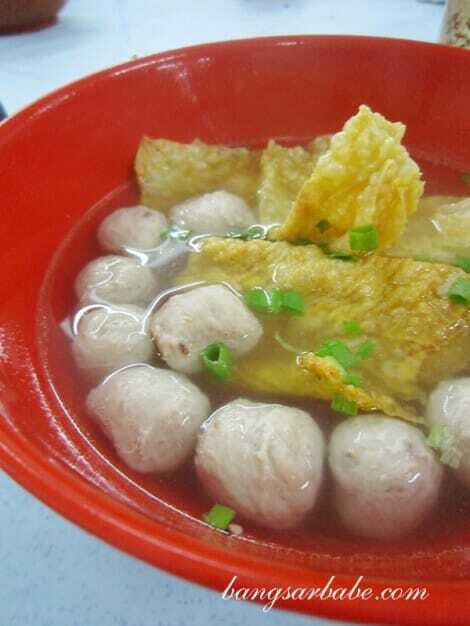 We also had the pork ball soup (RM6), which was nothing to shout about but good enough to eat with the pan mee. My visit to Kin Kin was fairly pleasant; no scolding from anyone and the noodles were tasty. I wouldn’t mind coming back every now and then if that’s how they treat customers these days. Verdict: Nice, springy noodles and the chilli flakes that pack a punch. i think the grumpy brother is at solaris, maybe thats why the service is a little better haha. i am a big fan of Pan Mee too…which part of Klang serving the good bowl? Fatty Pan Mee? 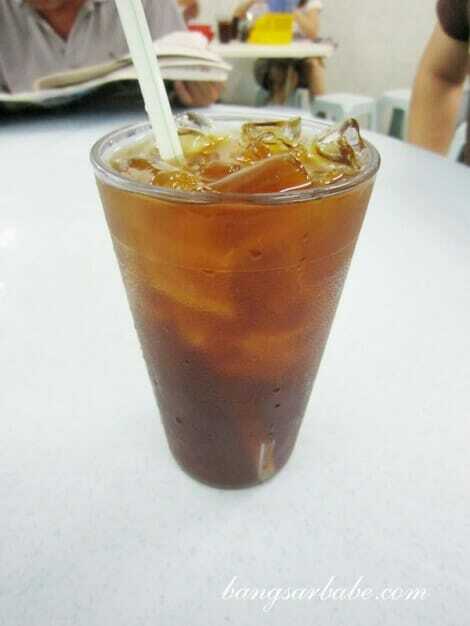 I tried there b4 .. but it was very very long time ago..
After eat @ d place .. i lau sai (diarrhea) LOL …. Waaaa…poor you! Maybe too much chilli? Ya…wait until grey hair can come out lol! Nod Nod Nod .. i put too much of chili ..
Last time i remember that we cannot order by ourself..
Make that a double egg pan mee! They’ve a branch at Pandan Indah with air-cond, clean, fast & friendly service and same standard chili pan mee 🙂 Hv u tried before? Yup. Tried that branch as well. Same quality…but very the far la! My mom had the worst msg attack at this place. i got the worst scolding for recommending her this place too. I didn’t feel thirsty…but that’s probably because I didn’t drink much soup. I usually just go to Jojo since it’s clean and the service is fast. Pan mee not too bad also. Your bowl of noodle lack of something which I normally ask for. Now, the main shop at Jalan Dewan Sultan Sulaiman 1 open till 9pm?